I forgot how much I love a cute zig zag quilt. For this one I used more of my Pez fabric and some other larger pieces that were floating around in my stash. It’s such a nice feeling to use up some of those bits that are too big for the scrap box but get lost in the yardage. This quilt is the PERFECT gender neutral quilt. LOVE the colors and how you arranged them. Can't wait to see how you finish it! So great to find your blog..love that cute quilt!!! I love it! I have got to make one of these someday. Me too! Love the Zig Zag – infact I absolutely love anything made with HSTs. This is lovely. this is absolutely adorable. You inspire me!! Beautiful quilt! I love the colorplay. Well done! Oh, I just love that! You are amazing what you can do with your scraps. And you just keep making them. So inpsiring. Love it. zig zags are on my list. Yours turned out great. Love this quilt – it has a very fresh, clean and bright feel. I never get tired of zig zag quilts – they always look so fresh and pretty – especially with the white. What a bright and cheery quilt! I've never made a Zig Zag quilt but yours has inspired me. 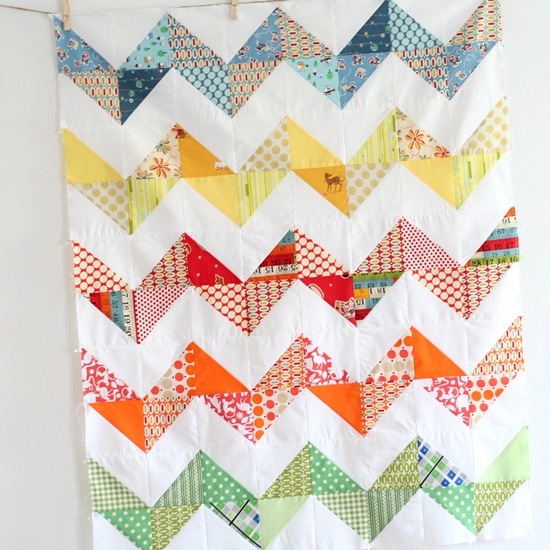 Love the fresh colours and I love Scrap quilts, so will definitely make one ……….. eventually! This is wonderful! I have got to try one of these at some point. I love this top. Great scrap buster! Gorgeous. Love the rainbow colours! Its great. I love the range in each color + white. lovely. LOVELY! I really like the scrappy look but with the color families staying together. Is it a present for someone or are you keeping it? I love this SO MUCH. I hope you don't mind me stealing the idea! This is one of my faves! I have to make one of these! It's gorgeous! i want your stash! great quilt. this is so pretty…i love the rainbow of color. That is so darn cute! LOVE IT….what a great use to get rid of scraps. O.M.G. Stop! There is so much inspiration on this site I can hardly get started on one idea before wishing I could start on the next. Thanks for sharing your gifts!! darling quilt. i just made one too. Just love it – great idea to use up those larger scraps! I think I can use this for my kids beds…boy colors for one and girl colors for the other. Thank you! Your blog inspired me to get quilting and sewing again– Thank-you so much for sharing your talents with us all! I love this! I've bee looking for a design for a red and white quilt I've had in my mind for ages, I think it would look great using this pattern! Thanks for sharing! Will have to get sewing now! Really cute- love the colors! I love this, it's so cute. A zigzag quilt has been on my list for a while and I just haven't gotten around to it yet, I really need to! oh my, this is so great! I have been wanting so make a hst quilt, and it would be great to use up scraps doing so! going to check out your tutorial! I love this quilt…thanks for sharing how you did it!! LOVE! Super inspiring. There is something about the colors that you use and they way you put them together that make me happy. This is gorgeous! I made a rainbow zig zag quilt almost exactly like this a few months ago and it's still one of my most favorite quilts! Rainbow order (or close to it) is so happy! Totally in love with this! Wow, always loved zig zag quilts and will give it a try. Love yours and you make them so fast. You are amazing. Very cheery! I really adore the fabrics you used too! I have never thought of a zig-zag quilt until I saw this one! Very creative use of the scraps — love it! I am definitely keeping this pattern in mind for a new quilt! Thanks for sharing. I've got my fabrics all picked out to make one. Thanks for sharing yours. This is so fresh and bright…perfect for waking everyone up in the Spring!! Keep up the beautiful quilting! That's so pretty. I love the ruler fabric that you used. I love it when you can use triangles and still only piece squares! Can I ask you a question?? What size were your individual squares?? I want to make this for my daughter, but I am not sure how big to make the squares?? I looked in your shop and it is not there anymore…. I'd love to know about how big your squares were and then I can eyeball it!